At Hodges Associates, all our work begins with one key step: develop a marketing strategy that will get results. Our clients come to us with a “purpose,” and we deliver. These case studies show just a few examples of how we’ve helped clients reach – and exceed – their marketing goals and grow their business beyond their expectations. Generate awareness and attract new patients for the group’s specialized vein care services. In addition to providing comprehensive radiology services for area hospitals, imaging centers and other facilities, VR has an on-site Vein Care Clinic where their interventional radiologists offer the latest minimally invasive procedures for varicose and spider veins. . Developing a digital-based creative marketing campaign based on the theme “Grab the Shorts,” which encourages potential patients to visit VR for vein treatment that will allow them to show off their legs when it’s “shorts season.” Digital campaign elements included Pay-per-Click advertising (a cost-effective strategy that uses key search words so the client’s text ad comes up at the top of search engine result pages) and strategically-placed online display ads. Both types of ads automatically linked to an online landing page with the unique url – GrabtheShorts.com. 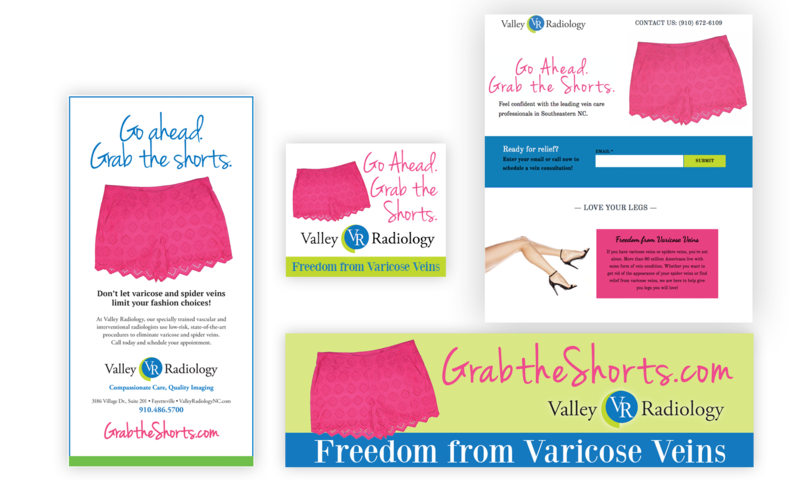 In addition, marketing VR’s vein care services was reinforced with print ads, a TV spot and billboards directing readers/viewers to visit GrabtheShorts.com for more information. We definitely got things “moving” for Valley Radiology! During June and July (VR’s peak vein care season), the campaign generated 1,080 visits to the landing page, about 85% of which were new visitors. In just two months, we helped generate 86 new leads for vein care, and these leads turned into 56 new patient procedures! What’s more, by using an email submission form on the landing page, we’re able to build and continuously expand an email database that allows VR to continue marketing to potential or recurring vein care patients. Briggs & Sons Tire, an independent Goodyear tire and automotive service dealer with multiple locations in the Fayetteville area — owned and operated by the Briggs family. Help this relative “newcomer” to the market generate brand awareness for the Briggs name and capture greater market share. 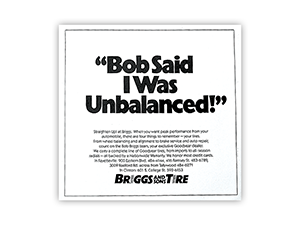 Sales for Briggs & Sons Tire went from $3 million to $6.5 million in just two years! 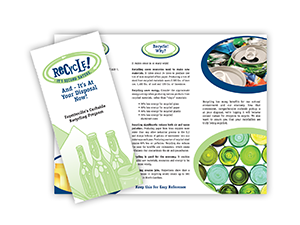 Generate awareness for the city’s newly-implemented curbside recycling service and encourage residents to recycle everything they can and make regular recycling a household habit. Developing a creative campaign based on the theme “Recycling. It’s Second Nature,” which conveyed a dual message of making recycling “second nature” and giving recyclable materials a “second life” (and keeping them out of landfills). 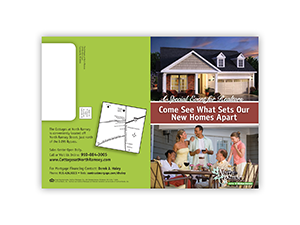 The theme was used in multi-media advertising, as well as collateral materials including tags attached to homeowners’ garbage carts. We also recommended and helped implement other creative ways to build awareness: launching the program with a high-visibility media event at City Hall, “manning” booths at popular local events, and holding a recycled art show in conjunction with the Arts Council. Participation far exceeded the City’s expectations — with 70% of homes recycling in the first year! In subsequent years, many people have traded the original carts they were given for larger carts so they can recycle more items. See the work. Hinkamp Jewelers, a family-owned, independent jewelry store offering a wide range of products, including high-end “name” brands. In business since 1955, they are well respected in the community. However, they face growing competition from chain stores and larger (multi-location) independent retailers. For this particular project, capitalize on the launch of a new line by the well-known company, Simon G., to generate sales, while bringing customers “in” to highlight Hinkamp’s presence and competitive position in the market. 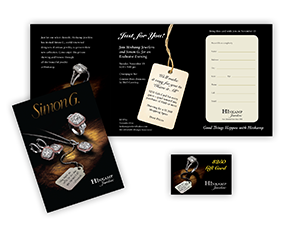 Creating a stunning and “irresistible” invitation to an exclusive event, showcasing the Simon G. jewelry line, and mailing it to a targeted list of strategically selected clientele. Obviously, the “irresistibility” of the invitation – and the well-chosen target audience – worked. The event generated $35,000 in Jewelry Sales in 3 Hours! Getting people there also reinforced Hinkamp’s image (as the place to shop for jewelry) among past, present and “potential” customers. See the work. House of Raeford Farms, a leading poultry processing company with world-wide sales. Redesigning House of Raeford’s retail product packaging. While they had grown, literally, from a “backyard” family business to a major player in the poultry market, their “utilitarian” packaging did not reflect their present “status” or the quality of their products. Beginning with strategically planned market research, we uncovered vital factors that influence consumer appeal and choices. 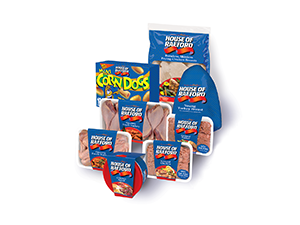 We utilized this information in the package design and partnered with an experienced, well-respected company for package production. Making Something Happen for Our City’s Growth & Image/Making Something Happen for Our City/Making Something Happen! Greater Fayetteville Futures (GFF), a citizen/community-based coalition launched by business and civic leaders to promote greater economic prosperity in the Fayetteville area. Creating a multi-media campaign based on the theme: Something’s Going On in Fayetteville – Come be a part of it (or You’re the best part of it). All advertising had a consistent, upscale look, with photography that highlighted attractive features of the area. The flexibility of the campaign allowed us to use it in advertising targeting multiple segments, including economic development, travel and tourism, and local residents. We also created a public relations “entity” called FYI Fayetteville and conducted an extensive PR campaign in statewide and national (as appropriate) media – and here at home. 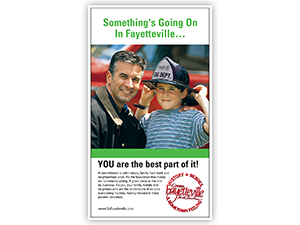 The widespread advertising campaign, in conjunction with our public relations efforts, was successful in generating significant publicity about the greater Fayetteville area and enhancing its image. The ‘buzz around town’ indicated that many people were taking a second look at the great things their hometown had to offer. Setting Our Client Apart … by Higher Sales! Initially, this community had cottage (townhome) style homes (four units each, attached). When McKee Homes added detached (single unit) homes at The Cottages, our mission for this particular project was to provide the marketing support that would generate widespread awareness of these new homes. We created an invitation to – and helped organize – a special luncheon/tour event for realtors, then developed a direct mail postcard and an ad targeting the general public, inviting them to a three-day open house (Friday, Saturday, Sunday) following the Thursday realtor event. All of these materials were based on the theme “Come See What Sets Our New Homes Apart.” They highlighted the outstanding features of the new homes, in addition to providing event details. More than 500 people attended the realtor and open house events, and this led to the sale of several homes … great results, particularly in the midst of a down real estate market at the time. 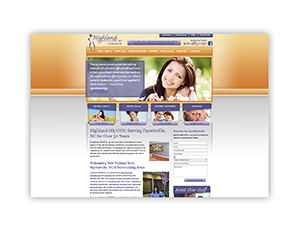 Highland OB/GYN, a Fayetteville-based obstetrics & gynecology practice. Create a new website to help the practice attract new patients and provide interactive features. We developed an updated, easy-to-navigate website, with a fresh, appealing look. The site was strategically designed to rank high in search engines to reach those searching for this type of physician. This user-friendly site allows people to schedule appointments online and access forms that need to be filled out. A “Patient Portal” also allows patients to communicate with their health care team and pay bills. Almost immediately, Highland was getting as many as 15 new appointments a week through the site’s “Schedule an Appointment” feature. And the majority were new patients to the practice! See the work. Hodges Associates can give your business similar results! Contact us today at (910) 483-8389, and we’ll work with you to develop a marketing strategy that’s right for your business. From our base in Fayetteville, NC, Hodges Associates partners with clients to provide expert marketing, advertising and public relations support. Our capabilities span the spectrum, including market research, creative advertising for all types of media, internet marketing, audio/visual presentations, collateral materials, technical writing, media placement, publicity & public relations, event support and more.